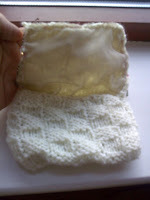 I have made this small flap purse for my mom. Actually this purse was supposed to be a scarf for my husband, but I jumbled up the pattern here and there and then didn't find the inclination to continue. So I improvised the scarf and gave it the shape of a purse by folding it. 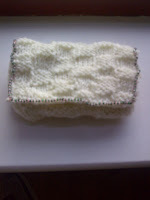 I have tried to decorate this small purse with beaded outline.I got the idea of the scarf from about.com. HI hope your having a nice time knitting!Ans sorry you couldn't finish the scarf you were trying but I really like the purse too!